ISO certified language tuition company Baltic Media Ltd offers you to study foreign languages in a fast and qualitative way in groups or individually. We enrol no more than 5-8 trainees in a training group therefore the lecturer can give maximum attention to each trainee. We also offer you to apply for individual tuition! Language service provider Baltic Media Ltd has been operating in the Baltic and Scandinavian market for more than 25 years and has been certified according to the requirements of Quality Management System ISO 9001:2015. Therefore we choose only the best lecturers to guarantee the high quality of learning and an outstanding result. Convenient location in the centre of the largest cities of the Baltic countries with parking opportunities. You can get to us by tram, trolleybus or bus if using public transport. Payment can be made in a single sum or by installments, as well as by concluding the leasing/payment contract. Mobile phone +371 29 44 68 45. Our Head of Language Training centre Mārīte will always try to find the most appropriate solution for you! In order to receive a quotation for this service, please contact us by using a free quotation form! 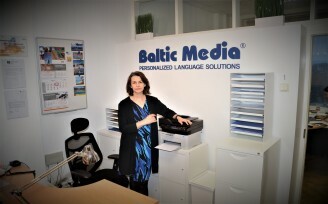 Why choose Language Service Provider Baltic Media?